I started writing this post tucked up in my van, wrapped in a blanket, wearing two jumpers, pjs and slipper boots, with a single measure of red wine in a tiny bottle by my side. The sun had set and the rain was hammering down, as it had been all day. All weekend in fact. It always sounds worse when it’s hammering on the roof three feet over your head, but I find it strangely comforting. I had the best adventure at Coed y Brenin last weekend – for so many reasons. 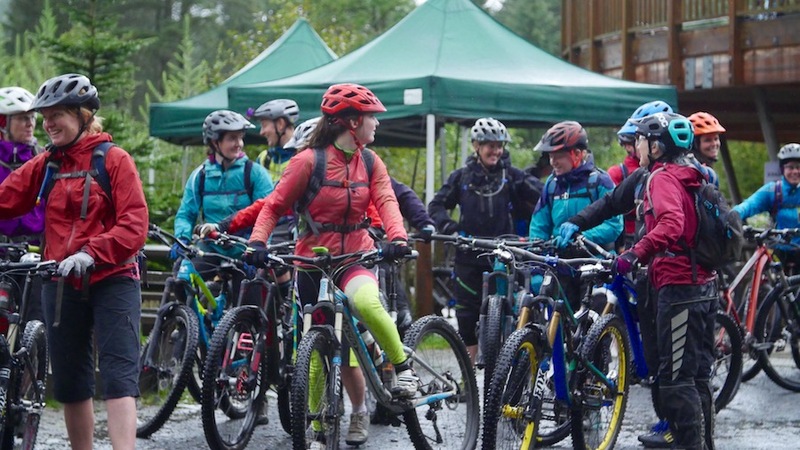 It was the first ever Temtiwr women’s mountain bike weekend at the trail centre (named after one of the trails), organised jointly by Welsh Cycling and Beics Brenin, Infinite Exposures, Natural Resources Wales and HSBC Breeze. If you’re a regular reader of this blog, or follower of my Instagram, Twitter or Facebook page, you’ll know I’m happiest when on two wheels, and this weekend was a weekend just for me. 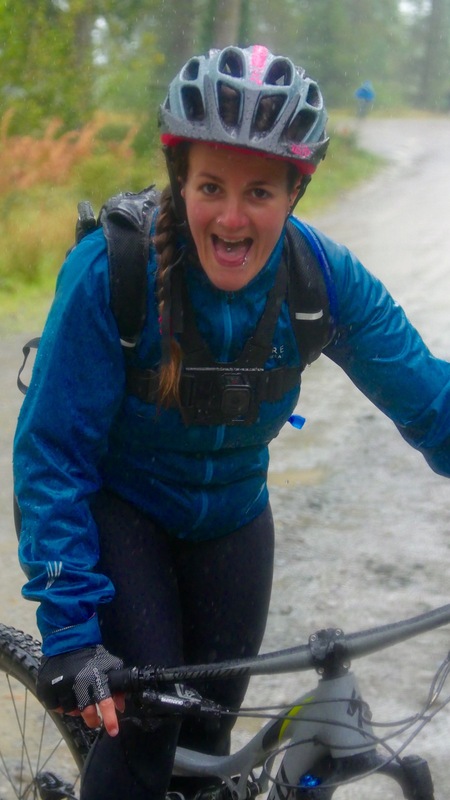 I was so excited about it ever since I signed up – a road trip to Wales all by myself, (the furthest I’ve ever driven alone, #thisgirlcan), the chance to ride with other actual real women (what a treat! ), and time in the van to write as much as I like. Incidentally, not much writing got done, hence why I’m finishing this now, wrapped in another blanket, on the sofa, two kittens going batshit crazy around me, as they do whenever I need to concentrate. I’ve only been to Coed y Brenin once before – last summer when me and Chris did our tour of the trail centres over the Bank Holiday. It was my first trip back to the trails since breaking my collarbone and wrist, and we crammed in four trail centres over six days so didn’t have much time to really explore. For the Temtiwr women’s weekend us girls outnumbered the boys – taking on the torrential, neverending rain with gusto – and it was wicked. Kicking off the weekend: a challenging, blissful and brilliant yoga class from Polly at Mountain Yoga Breaks. In true Tess style, even though I drove up the day before so I *wouldn’t* have to rush about in the morning to get there on time, I ended up sprinting from my parking space (helpfully the furthest away from the building for no real reason other than I was too scared to park in front of real humans) and bursting in to register with two minutes to spare. I didn’t know what to expect from this class as it was mixed abilities and we hadn’t practiced together, but it was one of those yoga classes where your muscles shake and you break a sweat, and your body laughs at you for trying seemingly simple manoeuvres (all of the shoulder poses, I’m looking at you). The kind of practice where downward dog becomes recovery and savasanah feels like the best-earned two-minute lie down of your life. We did sun salutations and warrior pose facing floor-to-ceiling windows that looked out to a rain-drenched Coed y Brenin forest. It was just as perfect as it sounds. After lunch we got into groups and headed out on a social ride. This one wasn’t guided or led, but a chance to just do what we were all there for and ride our bikes. The Coed y Brenin team talked us through each trail and what to expect so everyone could pick to match their ability. A few of the girls hadn’t been there before so it was especially helpful for them. I kind of had it in my head that I’d ride MBR at some point over the weekend (Chris has ridden this with the kayak club and reckons now we’ve done W2 at Afan I’d be ok) but after hearing that there are some drops where you can’t see the landing I lost my bottle and opted for easier red Cyflym Coch (aka Red Fox), which I’d done before. It’s a good little red trail, this one. The easiest red of the lot, but it’s got it all – technical climbs, fast, flowy descents, rock gardens, water features, berms, a few small drops and obstacles. A very Tess-friendly, fun-fuelled trail. There’s always another day for MBR. I hooked up with new buddy Pippa, who happened to be camping at the same campsite as me. We chatted as we rode, swapping stories of how we got into mountain biking and cycling in general. 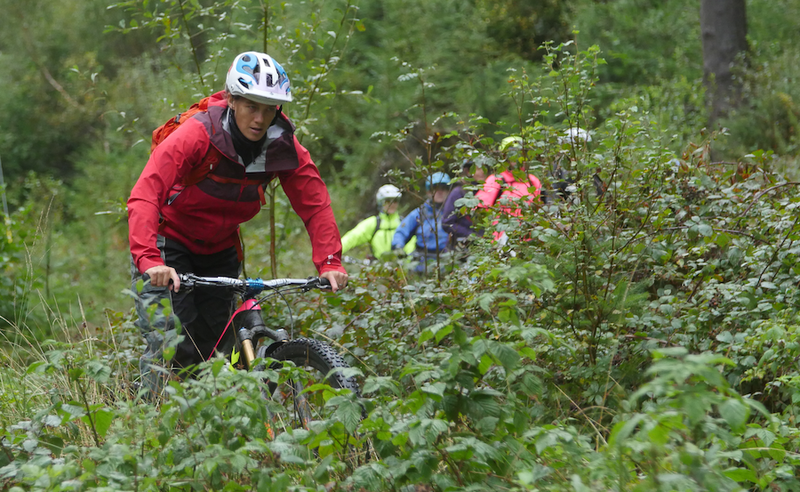 Nearly everyone we came across was female – it really was great to see so many women out on the trails! Something I’ve never experienced before. After the ride it was time for our pre-ordered food (and beer) which I promptly wolfed down before taking a photo but promise it was good. Then the film. If you’ve not seen this yet, and you’re into mountain biking, I urge you to watch it now! More than a few times during that hour a tear threatened to trickle down my cheek as we heard from the legends of the sport – the badass riders who were there at the beginning, and the mighty Martyn Ashton and Tracy Moseley about what cycling meant to them. Incidentally, T-Mo was sat just a few rows behind me as we had the pleasure of her company for the whole weekend! The film encapsulated everything I love about riding my bike and you could sense everyone in the room felt the same. “My greatest days’ riding was yet to come” – Martyn Ashton, on getting back on the bike after being paralysed. I headed back to the campsite excited, inspired and full of joy from an awesome first day at Temtiwr. The rain tried even harder to keep us down for the second day, but we were having none of it. #thesegirlscan. On the menu: our chosen workshops, coaching sessions and a guided ride – followed by a Q&A with downhill / enduro world champ and all-round badass T-Mo! Something to think about for the future definitely. Other workshop options included nutrition, trail side maintenance and bike set up. The subject of my intermediate coaching session was exactly what I wanted to learn – front and back wheel lifts. So often on the trail it’s far more efficient if you’re able to lift your wheels to hop, skip and jump over obstacles rather than pedal-pushing. It’s something I’ve never been able to do, and it’s caught me out on many occasions – the ridiculously technical climb half way through W2 at Afan last month a prime example. I found it really hard to get enough momentum to get over rocks and knackered myself out pretty quickly – also buggered my gearing up and got my chain caught which isn’t ideal. I have loads of GoPro footage from that trip that I *STILL* haven’t edited dammit! I can confirm that my new GORE® Element waterproof jacket is thankfully, very waterproof! So I was pleased to finally be shown the secrets to manuals, bunny hops, wheel lifts and pumping. We also practiced track stands but I’m OK with those after Sean at Marmalade MTB showed me on one awesome Surrey Hills ride. It absolutely hacked it down for the whole session but I loved every second of it and headed straight for the skills area to practice afterwards. After lunch it was time to put the new skills to practice for the ride. I was grouped in a leadership ride where we looked at the best practice leadership skills that would be needed if we were to become Level 2 mtb leaders. It was really interesting looking at everything through ‘leadership lens’ as our guide Steve called it. The ride is no longer just yours, but belongs to the people you’re guiding, and you have to make sure you look after them first and foremost. That means stopping at sections to discuss what’s coming and how best to tackle it, getting in a good order so everyone gets a nice flow, riding hills two abreast and all together so you can have a chat and keep it all nice and social. Definitely something I’ll be thinking about as we head into 2018 – apparently there’s not many female mtb leaders – something that needs rectifying! After the ride we ended the day (and weekend) with a wicked Q&A with the ultimate Queen of the Mountains, Tracy Moseley. We talked about coming back from injury, how to get over the fear (very useful for me to try and get over my fear after my accident last year), how to get into racing, what events to enter and more. Read 5 MTB tips from T-Mo herself in my write up on Total Women’s Cycling. I love how she just casually hung out with us all weekend and even led one of the rides on the Sunday (the beginner’s ride I think). Once it was all over I gathered my rain-soaked things and bike and headed back to the van with a bigger sense of belonging than I ever thought possible. Mountain biking is definitely where my heart is right now – and cycling in general. In a world that feels like it’s sometimes dominated by male ego, it’s good to know we’ve got our own community of badass women riders – that there are other girls riding – you just have to know where to look! Not that riding with the boys is a bad thing of course, but I really hope events like this encourage more women and girls to get out on their bikes. Some may not think women-only events are necessary but for others they’re vital for access into the sport, and a great way to make friends. 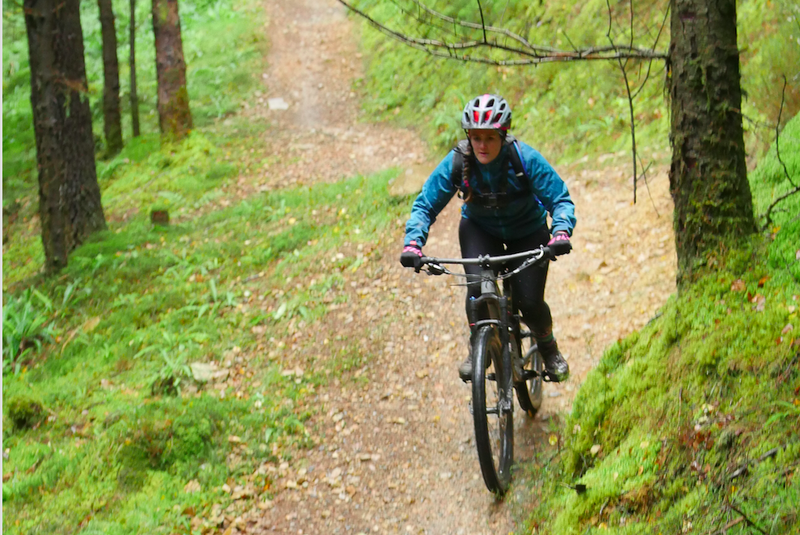 Temtiwr was the first of many women’s weekends at Coed y Brenin trail centre, jointly organised by Welsh Cycling, the trail centre and partners. The 2018 dates are 8/9 September and tickets are on sale now! Get yours at http://www.dyfievents.com/events/temtiwr/! To be kept up to date with the next events join the Facebook page and find out more about the trails and coaching on offer at beicsbrenin.co.uk. What do you think about women-specific events? How does riding your bike make you feel?